I finally dug out my Easter decorations this week in preparation for the holiday. This will be our first Easter with the kiddo so everything will be new and exciting for us again. Other than the obvious decoration-clad holiday of Christmas, I don’t normally decorate the house. One of the decorations that my husband’s family introduced me to many years ago though was the Easter tree. I had never seen or even heard of an Easter tree prior to my husband’s family introducing it to me. They started decorating their Easter tree when my mother-in-law was a young girl and her father had established some temporary German roots from the Canadian Air Force. According to Wikipedia, the Easter tree is a centuries old German tradition but the original origins have been lost. Our family will traditionally cut the branch of a tree in our back yard, bring it inside and hang small handmade wooden Easter decorations on it. If Easter is late enough in the year we may be lucky to bring in a flowering branch such as forsythia but it is usually bare branches from our birch or maple tree. Since my first introduction to the Easter tree, I have come across many variations. I’m thinking my eyes just weren’t open before, acknowledging what I have come to know as an Easter tree. I’ve seen many decoration and craft magazines such as Martha Stewart offering their play on Easter tree decorations as well. Maybe I was just living in a hole my entire childhood missing this beautiful decoration. Making your own Easter tree is too easy. You can now buy pre-made trees at craft stores or, like us, you can simply cut a branch (or a few small branches) from a tree in your yard and secure it in a flower pot or vase. Decorating the tree is up to your imagination! You can also buy pre-made decorations at craft or dollar stores or you may choose to make your own. Decorations can be made out of anything you want. Cutting Easter shapes out of scrapbook paper, decorate real or plastic eggs, or for a yummy tree, decorate with Easter candy. There is no wrong way to decorate your Easter tree! 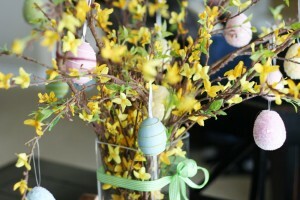 The Easter tree is a fun and easy craft your family can do together today a establish a tradition for the tomorrows. Change it up every year. Make themes; bunnies one year, eggs the next. Just have fun with it and enjoy! How do you celebrate Easter? Do you make an Easter tree?